Your New Farm dentist attentively gives all the information needed to address the concerns of his patients in a friendly and caring manner. 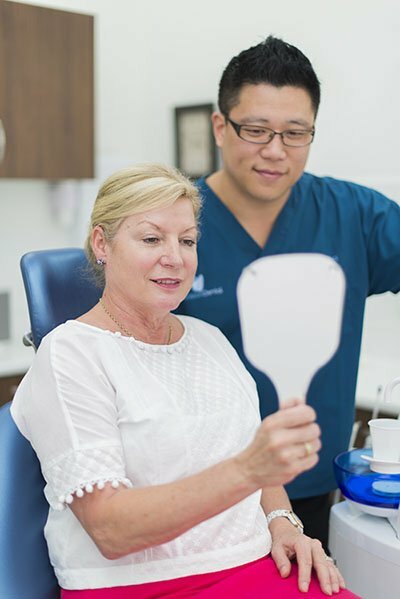 Dr. Billy Choi has been delivering outstanding dental service with his more than 10 years of experience in the field of modern dentistry.If you are looking for a New Farm Dentist then Precision Dental is situated in the heart of Brisbane and composed of skilled and dedicated dental team headed by Dr. Billy Choi. He has always been a member of Australian Dental Association as well as Australian Society of Implant Dentistry and the Australian Association of Laser Dentistry.In 2003, Billy graduated from the University of Queensland with a Bachelor of Dental Sciences Degree and had an extensive experience in all aspects of general and cosmetic dentistry. Precision Dental provides best-quality and across the board dental and oral health care for families. By offering you top-notch dental treatments and procedures, we can positively change your views about dentistry and embrace the fact that having a superior oral health truly makes a great difference. By taking a preventative approach, you help yourself including your family save money on preventable treatments and avoid discomfort from common dental problems such as cracked or decayed teeth. Your dentist here at Precision Dental recommends you to have regular monthly examinations so he can detect any issues early. Visiting your dentist regularly is the best method of dental prevention. Long-term dental health benefits every member of your family. We perform check-ups, complete your dental fillings and give your mouth a systematic clean. Also, we offer advice on how you can uphold a healthy mouth and preserve a beautiful smile. When it comes to your overall oral health, we can do a lot more. Having that perfect smile can make you standout from the crowd. You can achieve this with the help of an expert Cosmetic Dentistry in New Farm. For many years now, we provided solutions to patients who are less confident with their smiles due to the appearance of their teeth. It doesn’t matter if your teeth are misaligned or discoloured, as we have modern tools and techniques to correct those issues using our proficiency in Orthodontics, Teeth Whitening, Veneers, Implants and other smile makeover treatments. Our New Farm Dentist and the rest of the team are passionate to presenting you with quality dental care you deserve. We let you experience all that modern dentistry has to give by visiting our dental office. Precision Dental has comprehensive range of dental treatments that will uphold, restore and improve your overall dental and oral wellbeing. Our objective is to assist every patient in attaining and preserving long-term oral health and a healthy, fine-looking smile. Precision Dental offers free on site parking located in HQ Towers for the duration of appointment and has extended opening hours for your convenience. To start your journey towards admirable oral health, call us on (07) 3852 1160 or book an appointment online. New Farm is one of the most affluent inner suburbs of Brisbane, 2km east of the Brisbane central business district on a broad bend of the Brisbane River. New Farm is partially surrounded by the Brisbane River and is accessible from the northwest through Fortitude Valley and from the north via Newstead.